★This Platform has been moved to CNS-PF. 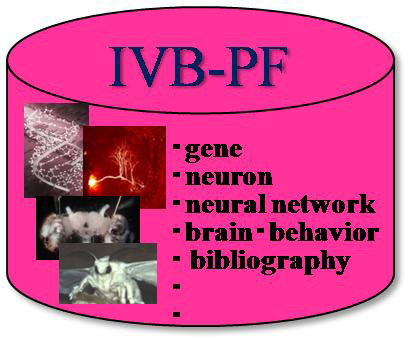 What is the Invertebrate Brain Platform (IVB-PF)? The Invertebrate Brain Platform offers you direct access to a growing database of information on nervous systems and behaviour of various species of invertebrates and a large body of ancillary material to promote the use of invertebrate systems in research and edcuation and facilitate information transfer to engineers that are looking for mechanisms that may be useful to solve a wide range of technological problems . The database is linked to explanations of the contents to allow users to familiarise themselves with the data and the context in which they were obtained. The platform has four entrance points taylored to different target user groups. The first entrance point is designed for users that are interested in using invertebrates for research purposes, in particular in the field of neuroscience, to assist them in intitiating research projects. A second entrance point is available for those that are concerned with implementations of design principles of invertebrate nervous systems and behaviour in industrial applications. The third portal is destined for providing quick access for instructors that intend to use invertebrates for educational purposes and the remaining entrance point facilitates obtaining general comparative information on sensory and central nervous systems and behaviour of invertebrates. Databases of sensory systems, brains, and behaviour of invertebrates, especially insects. The databases contain sensory organ structure and function, photographs and movies documenting insect behaviour, data acquisition equipment and other instrumentation, software, material for eduction, and bibliography. Detailed descriptions of sensory organs, brains and behaviour of invertebrates, especially arthropods. Comparative data for sensory systems, brains, and behaviour of silkmoth (Bombyx mori), cricket (Gryllus bimaculatus), blowfly (Protophormia terraenovae), honeybee (Apis mellifera), cockroach (Periplaneta americana), and crayfish (Procambarus clarkii) are available. Topics related to arthopod neuroscience such as insect-machine hybrid systems are also presented here. Silkmoth standard brain and brain image can be viewed from this site. Standard brain is a brain image and map with average shape and geometry. We obtained an average outline shape of moth brain from LSM brain images. Tissue image in the brain was registered into the average outline shape. Anyone use this image for extracting neuropiles and tracts and registration of segmented objects. Introduction to implemented and candidate industrial applications of invertebrate organisation principles, in particular insects. Insects can climb up vertical walls, fly, localise odor sources reliably over distances of several kilometers, and perform many other complex navigation tasks at different scales. The astonishing behavioural capabilities of insects and other arthopods are based on the control by a nervous system that is much simpler in design than that of mammals. Economy and speed are key features in arthropod information processing and effector mechanisms, features that are also highly desirable in engineering applications. Introductary descriptions and examples of educational applications using sensory and central nervous systems and behaviours of invertebrates. We plan to develop and provide student experiments, material for education and methods using invertebrates in collaboration with university and high school teaching staff and museums. The Invertebrate Brain Platform (IVBPF) is part of a consortium of web sites initiated and maintained by the Neuroinformatics Japan Center (NIJC), the Japan Node of Neuroinformatics funded by an international cooperation of the OECD. Copyrights for all material on this site are managed by the IVBPF committee and NIJC.